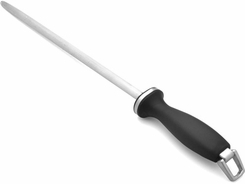 Restore your knives' precision edges with regular monthly use of the 10" Sharpening Steel by J.A. Henckels. Part of the German cutlery manufacturer's collection, this chrome-plated carbon steel tool easily sharpens the company's FRIODUR ice-hardened blades with just a few quick strokes. Magnetic steel catches the small particles removed from knife blade during sharpening. Compatible with both Four Star and Five Star Lines.